Three south west zoos are stocking sweets in compostable, transparent packaging which breaks down and disappears in soil. 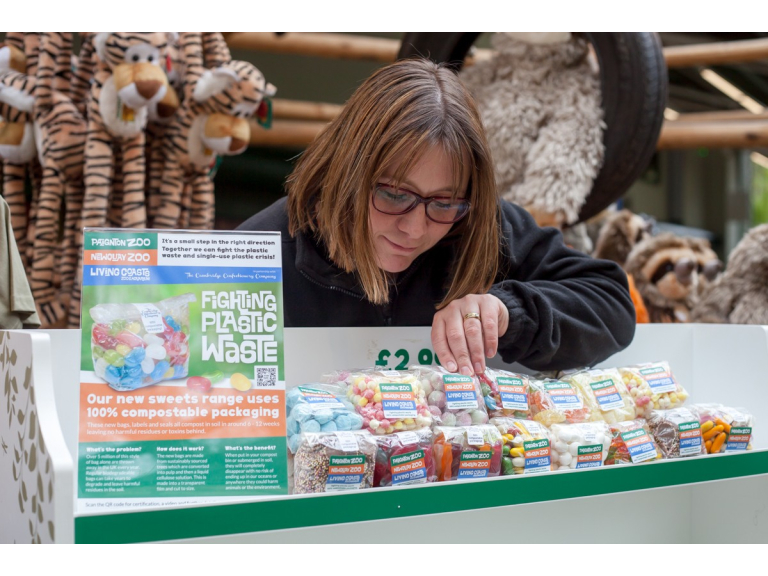 Newquay Zoo, Living Coasts and Paignton Zoo Environmental Park, which are all run by the Whitley Wildlife Conservation Trust, are phasing in the bags of sweets in partnership with the Cambridge Confectionery Company. Regular biodegradable bags can take decades to degrade and can leave a residue in the soil, according to Cambridge Confectionery managing director Nigel Baker. He was inspired to make this game-changing move after watching BBC’s Blue Planet and being appalled by how much plastic ends up in the world’s oceans. He said: “The move away from single use plastic is an issue that we started to address internally in 2017. We are hugely passionate about this and have been working long hours to come up with a solution using a range of technologies, and I am proud that we have brought it to market so quickly. “Along with our packaging supplier and some key customers, we are launching a home compostable bag with compostable labels and adhesives, which will also biodegrade in sea water. We decided to take this step pro-actively, with a significant investment rather than wait for our customers to ask for it. The new bags are fully certified and manufactured from sustainably sourced trees, which are converted into pulp and then a liquid cellulose solution. This is then made into a transparent solid film, which is coated and cut to size. Nigel Baker added: "The BBC footage about how much plastic ends up in the oceans really affected us all here and spurred us to do something about our packaging immediately. We are pleased to be leading the way in our industry and hope other retailers will join us in this revolution.